These are the shouts that will be heard in the bleachers of Werner Park in Papillion, Nebraska. 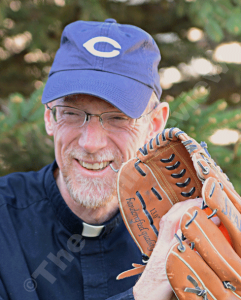 This Father’s Day, June 21, priests of the Lincoln and Omaha diocese are going head to head in a softball game at five o’ clock in the evening. The fun will begin with tailgating at 3:30 PM. Make sure to show up early to join in on the fun and cheer for your favorite diocese. Our local priest, Father Ross Burkhalter of St. Boniface in Elgin and St. Bonaventure in Raeville, will even be participating. Look for him on the field wearing the famous Babe Ruth’s number, 3. Is he ready for the big Father’s Day matchup? “I think the game is great. It’s for a great cause for the vocation life of the priesthood and I’m surprised we haven’t thought of it before, and I’m happy to be a part of it.” Father Burkhalter told The Elgin Review Friday morning. Father Frank Baumert from St. Elizabeth Ann Seton, Father Mark Beran from St. Mary in Wayne, Father Ben Boyd from St. Patrick in Fremont, Father John Brancich from Immaculate Conception, Father Damien Cook from St. Peter in Omaha, Father Michael Eckley from St. Pius in Omaha, Paul Hoesing which is the Vocations Director, Father Dave Korth from St. Augustine in Winnebago, Father Ryan Lewis from St. Thomas More, Father Oscar Perez from St. Peter in Omaha, Father John Pietramale from Our Lady of Lourdes, Father Andy Roza from St. Robert, Father Joe Taphorn from St. Margaret Mary, Father Kevin Vogel from St. Columbkille in Papillion, Father Michael Vaithofer from St. James, Father Damien Wee from St. Rose in Hooper/St. Lawrence in Scribner, and Father Weeder from St. Margaret Mary. Father Patrick Barvick from Cathedral of the Risen Christ in Lincoln, Father Ken Borowiak from St. Michael in Lincoln, Father Eric Clark from St. Michael in Lincoln, Father Mark Cyza from St. Benedict in Nebraska City, Father Craig Doty from St. Wenceslaus in Wilber, Father Jeffrey Eickhoff from St. Gregory the Great Seminary, Father Matthew Eickhoff from Holy Trinity in Brainard, Father Jon Haschke from St. Joseph in Lincoln, Father Jeremy Hazuka from St. George in Morse Bluff, Father Brendan Kelly from St. Wenceslaus in Bee, Father Bernard Kimminau from St. Mary in David City, Father Nicholas Kipper from St. Patrick in Lincoln, Father Jim Meysenburg from Pius X High School, Father Steve Mills from Cathedral of the Risen Christ in Lincoln, Father Daniel Rayer from Chancery in Lincoln, Father Tom Schultes from St. Patrick in McCook, Father Leo Seiker from St. James in Cortland, Father Mark Seiker from St. Elizabeth Ann Seton in North Platte, Father Michael Ventre from St. Mary in Nebraska City, and Father Michael Zimmer from Cathedral of the Risen Christ in Lincoln. The two teams participants look tough and are ready to battle for a win. Which one will take the gold? Take a trip to Papillion, Nebraska and watch the action. Ticket prices are Free for Priests, Religious, and Children Ages 3 and Under; $10 for a Single Ticket; and $30 for Family Pack (Two Adults=Children Under 18). If you haven’t purchased tickets yet, they are available at the gate..
“The game is definetly worth going to. It’s a great time in a beautiful venue for a great cause.” Father Burkhalter finishes. So everyone go put on your baseball caps and go to Papillion to go cheer for your favorite team!